With 79% of UK brands planning to implement proximity marketing over the next 6 months, beacons are all set to move out of the pilot phase and go ahead with mainstream deployment. Therefore, it comes as no surprise that there’s a battle brewing in the world of location-based beacons. 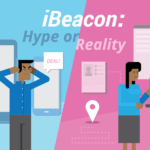 Infact, even the leading beacon players such as Estimote, Gimbal, Kontakt are fighting their way through by launching new, better beacons that will help overcome some of the challenges faced by the current ones. For example, Kontakt recently launched a cloud Beacon, that helps overcome issues such as security, monitoring, management and quality assurance. With so many beacon players in the market, it can be tough to keep track of new companies innovating in this space. In fact, one of the questions that keeps coming up in most of our conversations with potential customers is, how do beacon hardware players especially the emerging ones stack up? 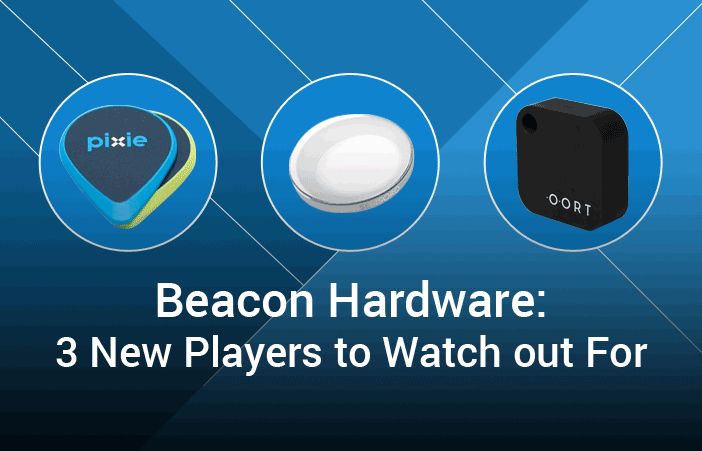 In this article, we will talk about 3 new beacon hardware players that are currently creating a lot of buzz. Among them, one is currently targeting businesses while the other two are targeting the personal space market. Though beacons were initially leveraged across various verticals to help brands enhance consumer experience, of recent businesses have begun to realize that these proximity marketing devices could also offer personal benefits by allowing users to interact with their personal devices via an app at home. While various players (like Tile, Estimote etc.) have been exploring their way around the personal beacon marketplace for quite some time, none of them have been able to solve the challenges faced with respect to size, range, and location accuracy. This is exactly what Pixie Point, a new beacon by a company named Pixie is trying to solve. Being one of the smallest, lightest and cheapest beacon options available in the market today, Pixie is now all set to take the personal beacon marketplace to the next level. For example, you can use Pixie Point to detect the exact location of a beacon installed device, something that was otherwise not possible with beacons. What makes Pixie Point different? (1) Small size: The Pixie Point is an ‘always-on’ location tag that measures just 3.2 mm thick, and resembles a slightly oversized guitar pick. This makes it small enough to for you to stick to your smartphone or fit in your wallet. (2) Range: The device works over BLE and can work up to 50 feet from your phone indoors and 150 feet outdoors. And the best part – it can pinpoint your items’ location with an accuracy of under a foot. While this already is a competitive range compared to the other beacon providers in this space, what gives Pixie Point the extra edge is that the range extends when multiple beacons network together. This is made possible by enabling the beacons to communicate with not just your smartphone but with each other as well. (3) Location accuracy: Most beacon providers merely offer hot-or-cold directions that lets users know if they are far or near to a beacon installed device. They don’t help with precise location detection. On the other hand, the Pixie Point beacon works together with the phone app and uses its network to help you locate your tagged items with colored “X’s as shown above. All you have to do is just open the app and hold the phone up. Pixie’s technology will then point out the exact location of each beacon using an ‘X’. Oort is one of the world’s first home automation system, that allows users to remotely control all the networked devices at their home with using a smartphone app. This is done by using BLE technology to send signals wirelessly from your app to the devices that are up to 50m away. Say, for example, you accidently left the coffee maker on at your home, in your rush to get to office. Depending on your notification settings, the Oort hub will send a notification informing you that you left the coffee maker on. You can then use your smartphone to turn it off by controlling the BLE enabled smart socket to which the coffee maker is connected via the hub. (1) The first IOT ecosystem to use Bluetooth Smart: Most smart home systems today are based on multi-radio technology, and therefore offer only few basic features. Oort on the other hand is exclusively based on BLE which allows them to innovate in ways other solutions can’t. (2) Enables users to interact with a wide range of appliances: Most smart home systems rely on Z-Wave or Insteon to pair products with compatible devices (thus ultimately reducing the number of devices that can work with the system). Oort, on the other hand is designed to interact with all standard appliances and connections. All you have to do is install a beacon on each such device and control it using your smartphone via the hub at your home. Yunzi by Sensoro, is a smart wireless sensor built on iBeacon technology. It is as small as a wristwatch and can be easily deployed. Yunzi’s technology makes it aware of its precise position, and the surrounding environmental conditions (such as light intensity) and seamlessly interacts with apps on your mobile device. (1) Sleek design: Yunzi features an elegant sleek design with a dual-color injection molding decorated by a high strength aluminum alloy keel ring that can be customized with laser engraving. Inspired by the semi-precious stone, Jade, Yunzi has an ultra-smooth texture to it and comes with a low-power acceleration chip and light sensor embedded in it. (2) Signal stability: It is perfect for stable long-distance data transmissions. While the radius power can be adjusted to suit the need, it allows for a maximum signal coverage of up to 80 m with 2826 m2 area. (3) Accelerometer: Yunzi comes with one of the most sensitive low-power acceleration chips currently available in the market. Your app will use the data from this chip to detect the exact movements of each sensor. As shown in the above image, in the configuration app, the information bar page of each beacon will display the corresponding accelerometer data. This data merely indicates whether the beacon is currently moving or not. For example, it will display the status as ‘Moving’ if the beacon is in a state of movement and as ‘Still’ if the beacon is at rest. (4) Light sensor: The light sensor embedded in the Yunzi beacon is highly reactive to light absorption and provides real-time accurate values, every time the brightness changes. (5) Enterprise grade device management support: Yunzi simplifies asset management of beacon devices. This device is supported by enterprise level security configuration and comes with an automatic sensor guard to prevent unwanted access. Are there any other emerging beacon hardware players that you think we have missed out on? Let us know in the comments below.